We moved into our apartment right before Christmas last year and as you can imagine with all the holiday rush we were lucky just to get somewhat settled in. Now, (8 months later) I’ve finally gotten around to sprucing up the place and getting everything a little more coordinated and let’s face it – grown up. I’ll add a few more updates as I add some final touches here and there but for the most part we’re officially living the coordinated life. The gallery wall in our living room never quite sat right with me so I did a little Pinterest research and designed this new layout. I love it so much better! With this new setup our old pillows didn’t work anymore so I bought four new ones and recovered two of them with fabric I had. This is a great tutorial on recovering pillows. 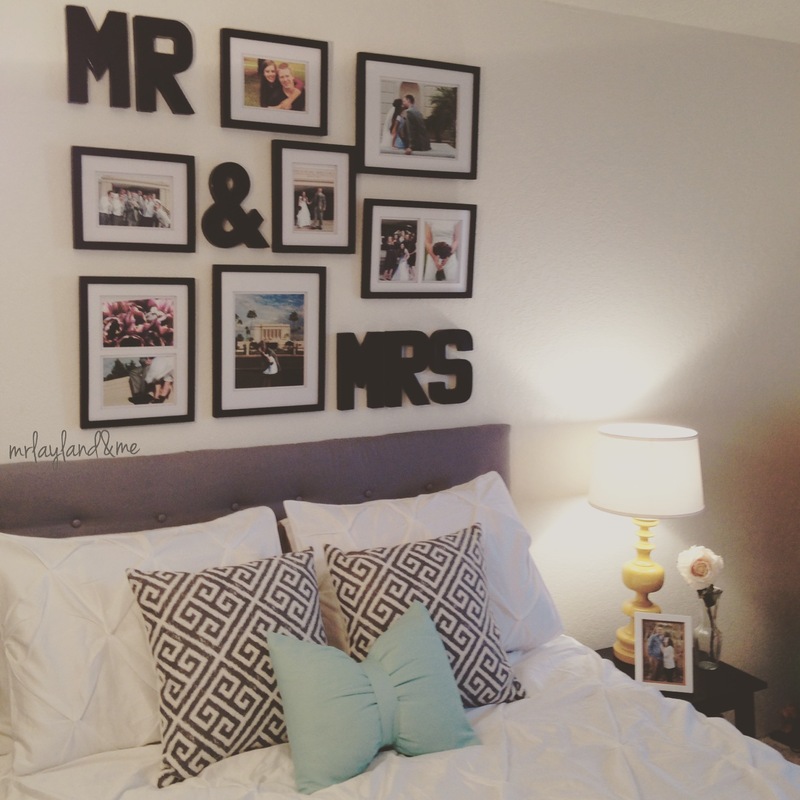 As for our bedroom I made the headboard using this tutorial as inspiration. It’s easy to do but it takes some time. The coolest thing out of this whole experience is that I learned how to cover buttons! 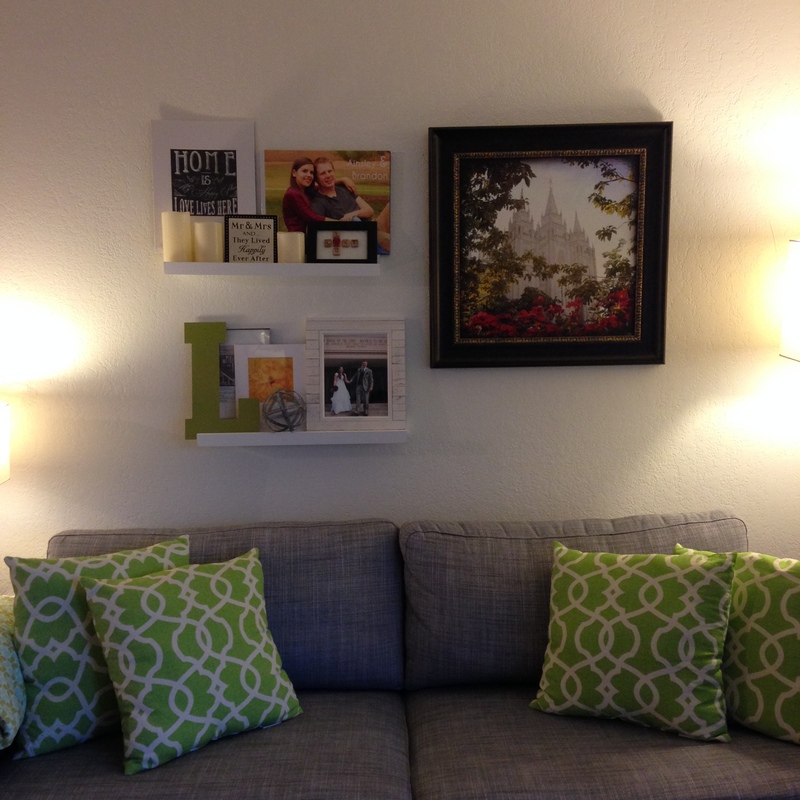 I bought the grey & white pillows from Target but I made the bow pillow featured on this blog. 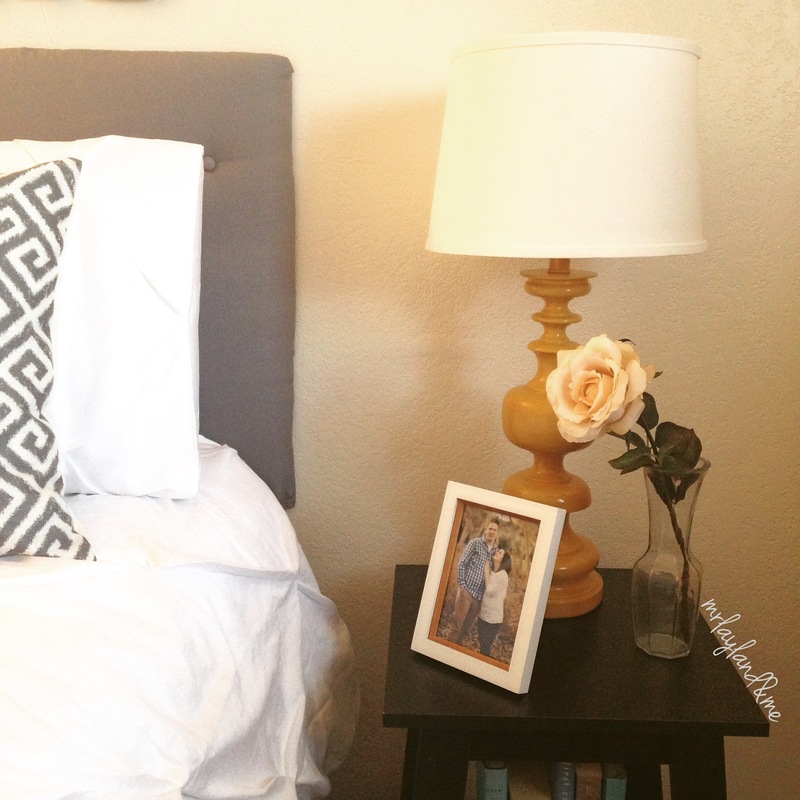 I got the duvet cover and shams from Target crazy on sale – thank you coupon codes! Last but not least – that amazing lamp? I scored it at Goodwill for $9 in perfect condition. It doesn’t get much better than that! With all the organizing and re-doing I moved my dresser and updated the paper in my “I Love You Because…” frame so it matched our room! The ceramic figurine was actually our wedding cake topper. 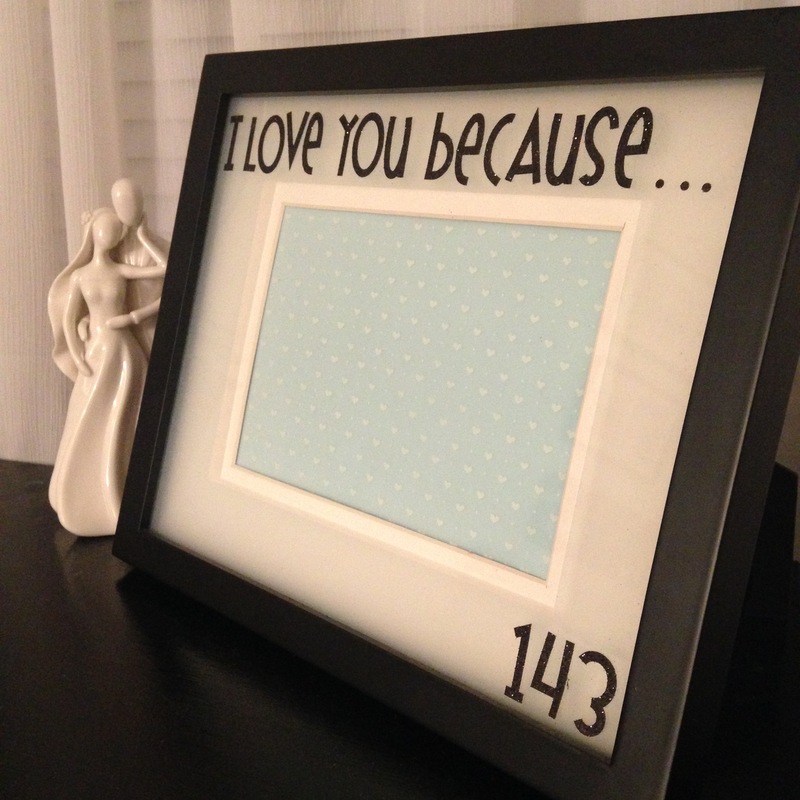 I picked it thinking ahead, knowing I would want something we could display in our home after we got married! 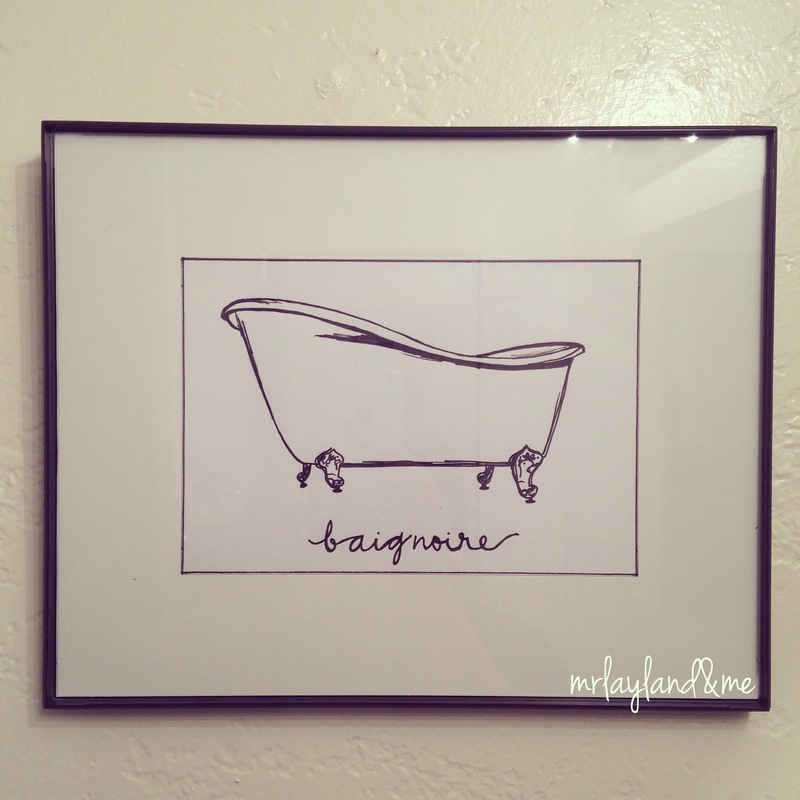 I had this dry erase calendar hanging in our bathroom that I finally admitted – we never use. 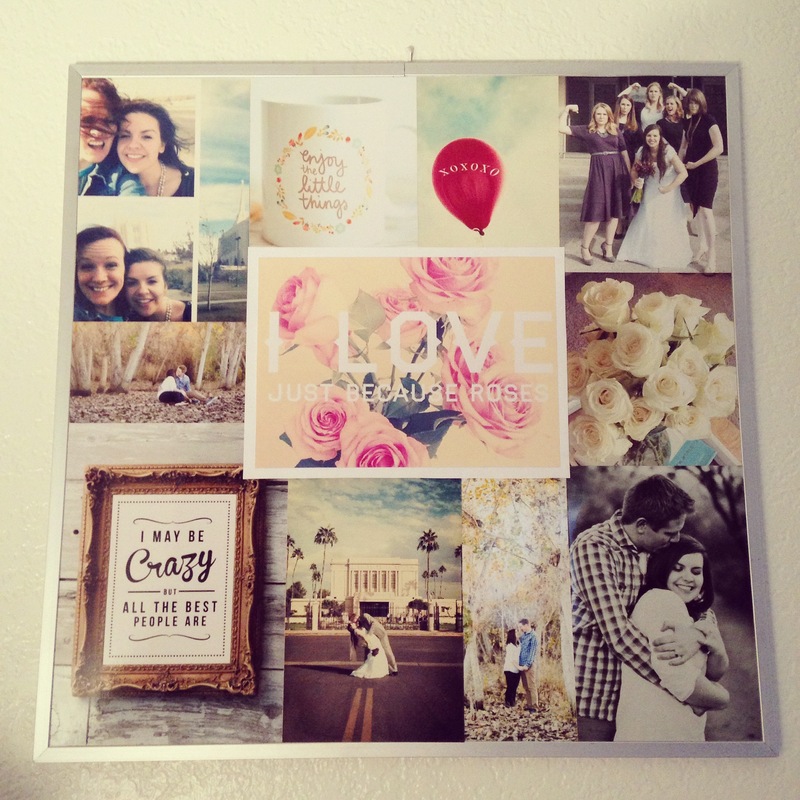 I was literally headed to throw it away when I had this genius idea to see if it would work as a photo collage frame! I arranged the pictures and used mod podge to set them in place and there you have it. This is the only thing I’ve managed to do in the bathroom so far. I’ve got a coordinating sink in the works so that’ll come soon! When I moved to Arizona almost 2 years ago (time flies!) I was amazed by the saguaro cactus. I’d never seen them in real life! Sadly cacti that huge isn’t what you would call adorable and no, I don’t want anything that monstrous and pokey in my yard. Ever. At the same time when I moved here I fell in love with succulents. They’re the coolest little desert flower cactus plant you’ve ever seen! They’re so funny looking and yes they make me smile 🙂 Once we moved into this apartment I wanted a flowerbed to hang over the ledge on our balcony & finally five months later — I got one! Aren’t they the cutest plants you’ve ever seen? The one that looks like a bunch of little grapes cracks me up – it’s just so funny-looking! I’ve had them for a few days now and they’re still alive and looking great. I’d had the dirt I used for a while and little aphids and teeny centipedes had found their way in…or grown in there…I don’t know, I don’t want to think about it — they were just there. And I wanted them gone. So I googled “natural methods to kill aphids”. Everything I read suggested lemon juice, dish soap, or vinegar. I figured I’d try all three at once and poured some of each into a spray bottle and filled it up with water. I sprayed the dirt then eventually just dumped it all in (this was before I planted anything) and let it sit for a few hours. It worked! No more aphids or centipedes or anything gross. Just adorable succulents! 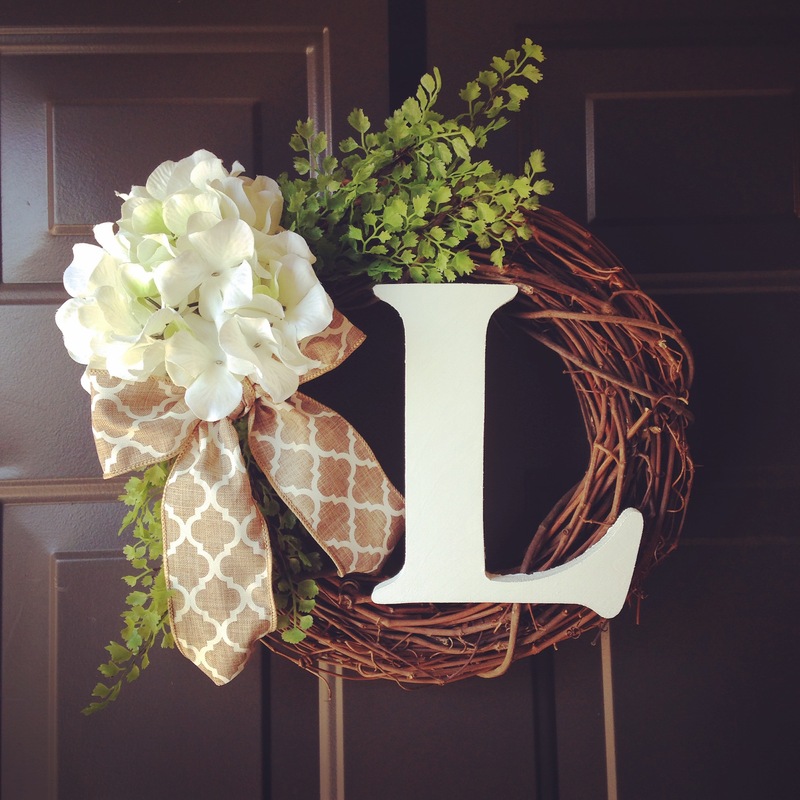 I saw this wreath on Pinterest and fell in love. Of course, that was probably three months ago and I just haven’t had the time to create one of my own. The heavens shined down on me this week though, because not only did I find the time but it turned out absolutely perfect. I honestly thought about flipping it around to hang on the inside of our front door so I can look at it more. That’s obviously unrealistic…but I thought about it 🙂 I got everything at JoAnn’s because what can’t you find there. Seriously. I even came away with a balcony ledge planter I’ll feature later this week. Like I said, they have everything. I fed the flower stem and the wire stems of the greenery into the vine wreath and then hot glued the bow in place. The L was originally just a plain wooden letter so I painted it white, let it dry, and then hot glued it in place. So far so good! Everything is staying in place even with the wind we’ve had! We’ve been settling into our new apartment for the past month or so and we’re finally wrapping things up! This wall only had the one big picture and looked a little empty so I figured I could add a little pizzaz to our set up. 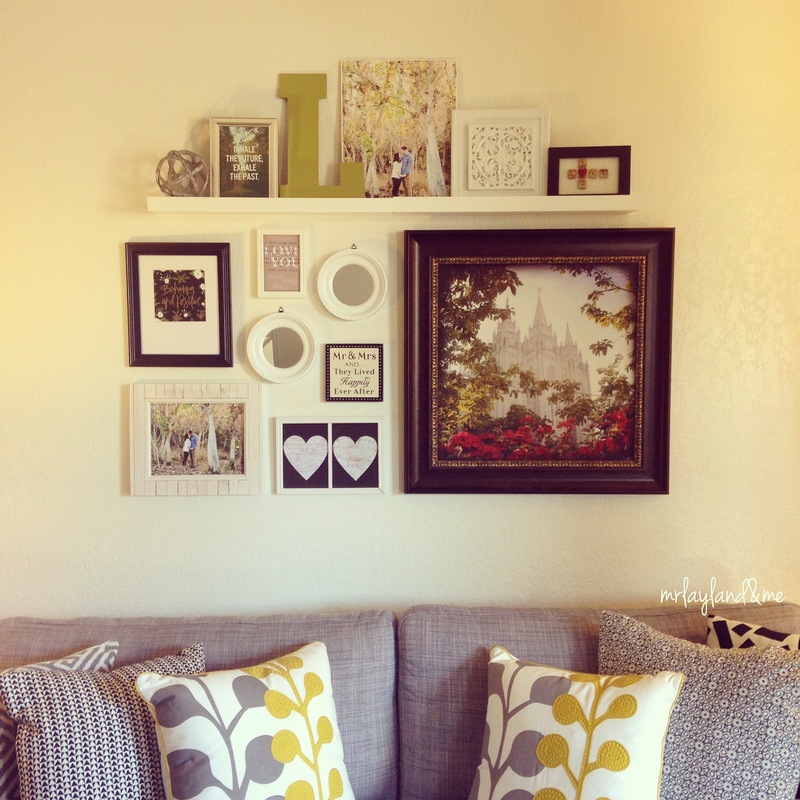 I got these floating shelves at Target and I absolutely love them. I was concerned about hanging anything too heavy so these were the perfect solution. I’ve been quite the handy-woman lately, assembling end tables, lamps, and china cabinets (all to come) so this was just one of many hammer & nail projects. 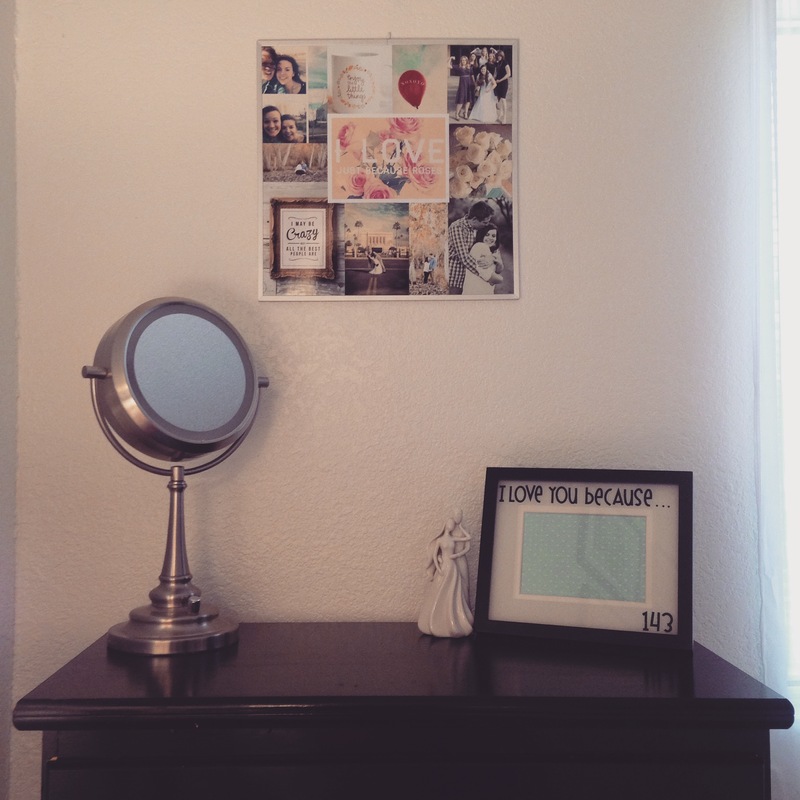 I mentioned in my Mr & Mrs post about how Young House Love suggests hanging pictures but I found a different way that works a little better for me. Painters tape! 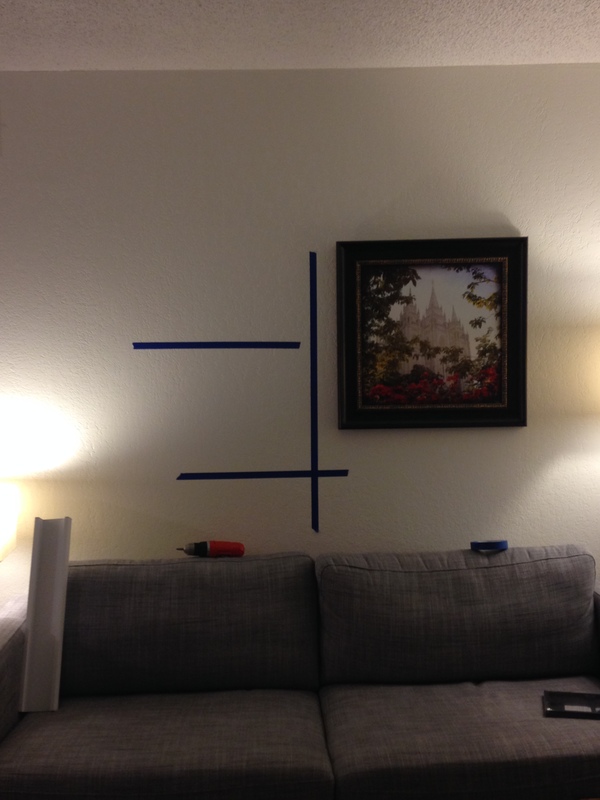 I assembled everything on the floor and measured out the middle of the couch then put a line of tape down the middle to measure from there. 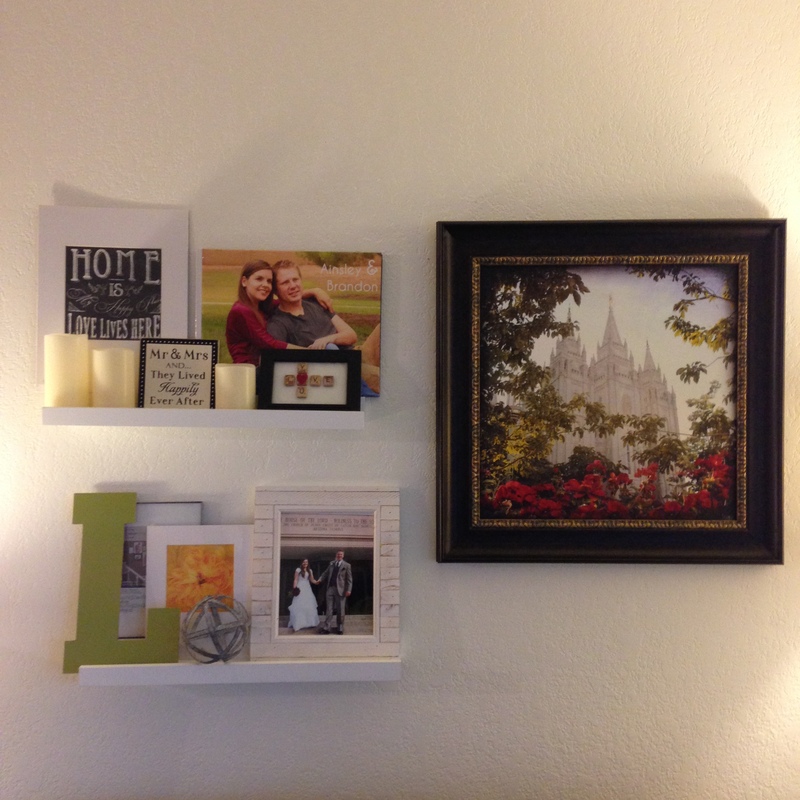 I hung the temple picture then put the strips of tape where the floatings shelves were supposed to go. The great thing about using painters tape is that once you put in your nails or screws you can leave the tape there and you won’t see it! So sneaky! We decided to move to our current apartment about five months ago and right around then I found these glass jars. And fell in love. I had to have them! However, we were going to move and what’s the point when that would just add one more thing to our moving list? So I waited patiently (and mentioned it every time we went shopping) until the day that I could actually buy these amazing jars! Aren’t they beautiful? Okay, so yeah I really love my jars. 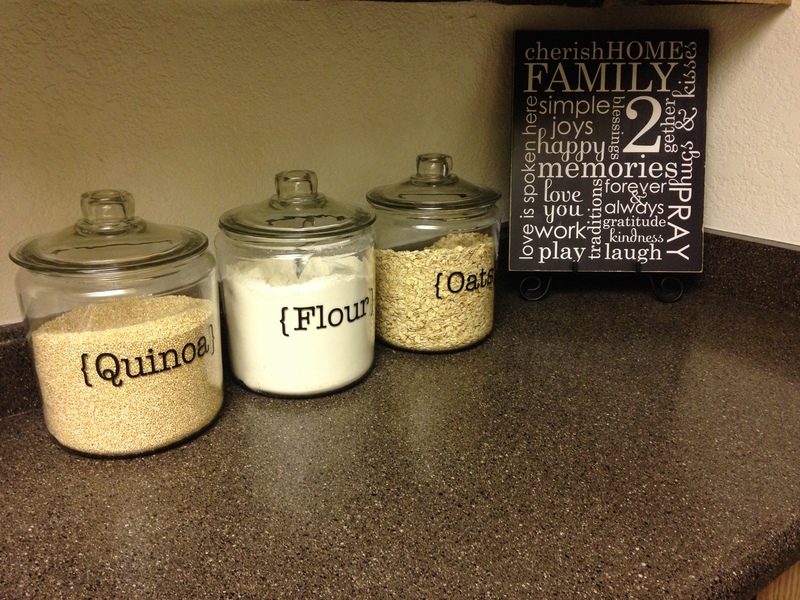 All the jars like this I saw on Pinterest were for flour, sugar, and brown sugar. 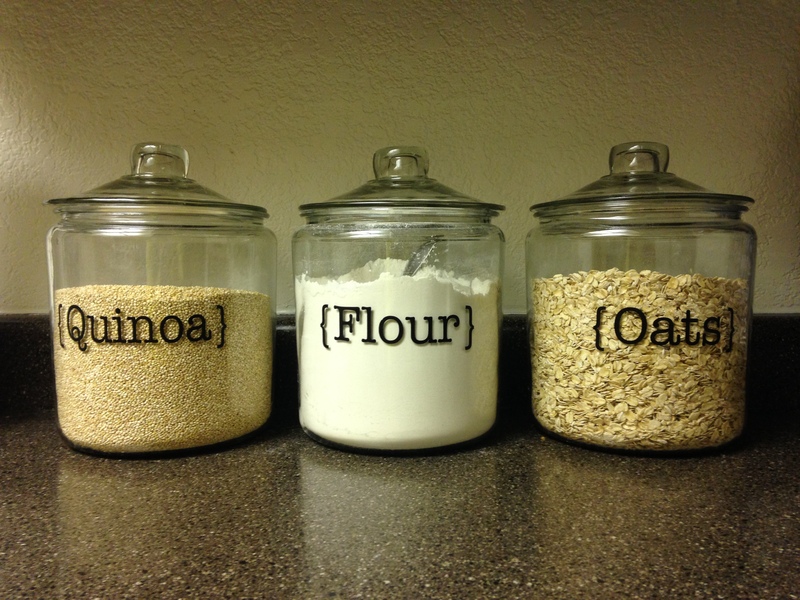 Makes sense if you love baking, those ingredients come in handy all the time. That was my original plan but of course before I even got the jars I signed up to run a half marathon with my cousin and went all healthy. Hence the quinoa & oats 🙂 I still bake, don’t get me wrong, just not as much! The tricky part was figuring out how in the world to put the words on! I tried using “clear” sticky paper I got at Staples but their version of clear wasn’t the invisible-clear I was going for. I talked to my Mom about ideas and she suggested I “get a vinyl lady”. Apparently she has one so I “got one” too! My Bishop’s wife gave us this beautiful tile for our wedding with our names on it in vinyl so I asked her for a favor and there you have it! Having a vinyl lady sure pays off! Every once in a while I get these crazy ideas for altering clothes or refinishing furniture and when it makes sense in my mind I go for it! So I did what any woman would do nowadays and I searched “rope tire ottoman” on Pinterest. Someone had already thought of it! It’s always a bummer when you realize you’re not as original as you thought you were but at the same time seeing those results come up proved that I had a good idea! Clean and dry the tire. Depending on where you pick it up, it could be really filthy, so take it outside to suds it up, rinse it off and dry it thoroughly. Use the hot glue gun to secure the wood circles to the openings on either side of the tire. Hot glue dries quickly so you may have to set the circle in place and then secure it around the edges. You are ready to completely cover the tire with rope. To start, wrap the rope around itself in a flat spiral effect so there are no gaps. Using the hot glue gun, secure the first few coils while turning the rope in your hand. Lay the flat coiled rope in the center of the horizontal tire and continue winding and gluing as you go until the wrapped rope continues down the sides of the tire, completely covering it. Make sure to glue the rope together while also attaching it to the tire to get a tight spiral. When the rope has reached the base of the tire, cut it and securely glue the edge down. At this point you have a few style options: Leave it as-is and set it in place for display, continue the rope spiral to the other side giving it a reversible effect, or attach couch feet for added height and polish. It was definitely a learning experience for me – 25 feet sure doesn’t reach as far as I thought it should! If you end up trying it out please let me know how it went in the comments below! Good luck!